Thank you for your interest in employment with the Diocese of Yakima. The men and women employed by the Diocese of Yakima are dedicated professionals who endeavor to support the mission of the Diocese in many diverse areas including spiritual ministry, formation, social work, education and administrative services. We are an equal opportunity employer who continually seeks qualified, dedicated and passionate individuals to support the mission and services of the Diocese of Yakima. 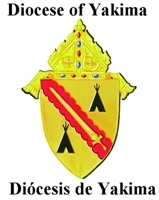 To view employment opportunities within the Diocese of Yakima, see below or click here. Employment opportunities are updated regularly. If you have unanswered questions concerning a position after reviewing a posted vacancy announcement, contact Diana Aparicio, Vice Chancellor, at (509) 965-7117. The Diocese of Yakima is seeking an Evangelization and Faith Formation Director. The goal is to develop Hispanic Catholic parishioners as leaders and be a liaison to share the work of PREPARES en español across the Yakima and Spokane Dioceses. This position will reside in the Yakima Diocesan office under the direction of Msgr. Robert Siler, Chancellor. Through this position, life and justice issues will be brought together, anchored in the works of mercy, with a natural faith formation structure that engages Catholic parishes and schools. The Evangelization and Faith Formation Director will build on Hispanic ministries already embedded in parishes and migrant ministries in Central and Eastern Washington. Holy Family Catholic Church in Yakima, WA is seeking to hire a full time energetic Pastoral Assistant for Children's Ministry. The candidate must be an active Roman Catholic who will have the passion, enthusiasm, and ability to bring Christ to our younger children and to encourage them in the development of a life-long relationship with Christ and with His Holy Catholic Church. The candidate must have a minimum of two to five years’ experience in Roman Catholic parish ministry. Candidates must have a passion sharing Christ to Catholic youth and encourage them in the development of a life- long relationship with Christ and his holy Catholic Church. Holy Family Catholic Church in Yakima, WA is seeking to hire a full time energetic Youth Minister. The candidate must be an active Roman Catholic who will model and passionately encourage our youth in Catholic gospel living and Catholic identity. The candidate must have a minimum of two to five years’ experience in Roman Catholic parish ministry. We are seeking a dynamic candidate whose responsibility is the planning and development of the Parish High School Youth Ministry Program. Essential job functions would be the ability to develop, coordinate and implement youth programs, faith formation and catechesis, Confirmation preparation, youth retreats, liturgies, and service opportunities. St. Joseph Catholic School in Kennewick, Washington is hiring a full time 2nd grade teacher for 2019-2020 school year and beyond. We are excited to hire a faith filled catholic who loves teaching and learning. Our teachers work hard and are dedicated. Applicant should enjoy working directly with students and understand classroom management. It is also important for the applicant to be a practicing Catholic who attends Sunday mass weekly and desires to follow the teachings of the church. Candidate must be able to pass criminal background check. We are hiring a full time Bilingual Secretary II for the parish office. The candidate will provide necessary secretarial/receptionist support to the Faith Formation Coordinators, Catechists, other office staff and volunteers so that the mission of the parish is successfully achieved. We are looking for a secretary who is a hospitality specialist and who naturally lives the charism of joy, makes visitors to feel welcomed, valued, and attracted to the Gospel and to our church through the joy they have experienced. Responsibilities vary and require initiative, sound judgement, and excellent organization skills. This is a fulltime, 35 hours a week, position which supports the mission of our children and youth Faith Formation and the daily office needs of the parish. For information contact the parish at (509) 765-6729. Tri-Cities Prep, a Catholic college-prep high school, is accepting applications for the position of Principal of this extraordinary school. All interested candidates should visit our website: tcprep.org for more information about our school and the application process. Please visit our Employment page for a link to the application. The application deadline is March 8, 2019. Please contact Lisa Jacobs at 509-546-2465 for any questions. PREPARES is an initiative of the Bishops of Washington state that is focused on developing support for families through the faith community. This position is responsible for the recruitment, and training of parish and community-based volunteers for PREPARES for the purpose of supporting pregnant and parenting women, families and their children up to age five. The position will coordinate with the Evangelization and Faith Formation Director with the Diocese of Yakima and Catholic Charities Parish Outreach Coordinator and other Catholic Charities programs for client referrals and resources.